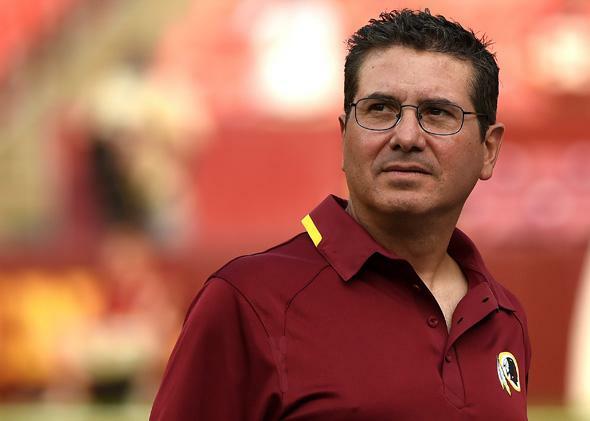 Dan Snyder, stadium deal: If the Washington owner gets public money to build a new stadium, it’s time to shut down pro sports. If Dan Snyder gets public money to build a new stadium, it’s time to shut down pro sports. The last man on Earth whom taxpayers should be subsidizing. The one thing Snyder hasn’t accomplished during his tenure is getting bushels of taxpayer money for a new stadium. But it’s only a matter of time before the cash-grabbingest jerk in sports succeeds in pulling off the sports world’s jerkiest cash-grabbing maneuver. If Snyder gets away with it—if any government, anywhere, gives him public money to build a new football palace—then it’s time for pro sports to be put out of its misery. Seventeen years seems to be the new magic number in the stadium racket. The Panthers sought nearly $200 million in public money for a renovation of 17-year-old Bank of America Stadium—and received about half. The Falcons began agitating for a new stadium in 2009 to replace the then-17-year-old Georgia Dome—they received a minimum of $200 million in public funding. Any possible public cost—and with two states and the District of Columbia likely bidding against each other for any potential stadium, there would definitely be a public cost—would on its own merits not be justified. Studies have shown that stadium subsidies of all kinds are poor investments, with the profits benefiting a small number of people and the high costs raining down on everyone else. But the fact that the bulk of those benefits would be going to Dan Snyder makes the prospect of a new D.C. stadium deal particularly revolting. Washington’s NFL franchise moved to Landover, Maryland, from Washington, D.C.’s RFK Stadium in 1997, and Snyder bought the team two years later. The stadium cost $250.5 million, with $70 million coming from public funds that were directed toward roads and infrastructure costs. This was a relatively small amount of public financing by modern standards, with subsidies running closer to half the cost of private stadiums in recent years. Snyder wanted more. Within 10 years of the stadium being built, and eight years of his purchase of the team, the Washington owner was already reportedly meeting with top D.C. officials about moving the team back to the city. In 2007 the Washington Post reported that, although the city was leery of any public financing deal after being fleeced for more than $600 million by Major League Baseball and the Washington Nationals to build Nationals Park, it was considering a deal to lure Snyder’s team. At the time, officials were considering the option of giving Snyder free land—a public subsidy by any measure—in exchange for asking him to pay for the stadium himself. Every few years these sorts of D.C. stadium deal rumors come up, despite the fact that FedEx Field is around the same age as Malia Obama. In 2010, D.C. Councilman Jack Evans proposed a new stadium in D.C. with a retractable roof and a price tag of $2 billion to $3 billion. (Now, there are rumors that Snyder wants a dome). In 2012 a proposal was floated that would allow Washington’s NFL team to break its lease with Prince George’s County—which expires in 2027—to move the team back to the city, in exchange for moving the FBI’s headquarters to Maryland. Last year D.C. Mayor Vincent Gray acknowledged that he had held talks with the team, and in 2012 former Mayor and current Councilman Marion Barry tweeted that he wanted to bring the team back to a new, domed RFK with a “big vision” pitch. Former Virginia Gov. Bob McDonnell, meanwhile, was publically wooing team officials in his final two years in office, sometimes against the wishes of state legislators. Maryland officials, for their part, responded to the latest new stadium reports by saying that they want to keep the team. Here’s how Snyder would summarize the previous paragraph: Cha-ching! Without even threatening to move the team—a standard tactic for owners who want to secure public funds without any public accountability—Snyder will have a bidding war on his hands. Publically subsidized stadiums are nothing new to the D.C. area—consider the almost entirely publically financed Nationals Park. A day at Nats Park, which opened in 2008, is lovely if you can afford it, but the promised Anacostia waterfront renaissance was delayed for years by the economic slump and the team’s bad play (both of which have mercifully come to an end). In any event, it’s not necessarily fair to ascribe any of the current development in the area to the stadium—the neighborhood that was rejected as a stadium site has experienced its own rapid growth, and research has shown that there is generally no statistically significant correlation between stadiums and community growth. Now that the team is winning and the economy is good, people in D.C. seem less concerned about the fact that the stadium is an economic boondoggle and that the city greatly overpaid to secure its baseball team. But D.C. residents are still wary enough to oppose the city’s next stadium project: Six in 10 residents are against Gray’s plan for a new stadium for Major League Soccer’s D.C. United—a plan that makes no economic sense. What’s different with the Washington NFL franchise is that the team is a fixture in the D.C. area, and is (mostly) beloved by people who live in the vicinity. That gives Snyder a lot of leverage in his quest to build a new stadium. Plus, there’s another card he can play if he so chooses. Multiple other commentators, including former Washington football team executive Vinny Cerrato, have suggested that Snyder may try to trade his racist team name for a bright, shiny stadium. The deal, essentially, would be: Give me a huge wad of cash, and I’ll name my team, say, the Washington Warriors. It’s unclear if Snyder would actually do this. It would, though, serve as a face-saving ploy, allowing the owner to yield to public pressure to change the name while getting something very big in return. The D.C. Council has voted to call on the team to change its “racist and derogatory” name. As such, Snyder floating the possibility of a name change could serve as additional leverage in any negotiation with D.C.: I’ll change the team name and move to the city, if you give me all the free land/public financing/tax benefits I want. But even if Snyder didn’t use the team’s racist nickname as a bargaining chip, a new publicly funded stadium would still be a disgrace. In the time he’s owned the Washington NFL team, Snyder’s plaything has increased in value from $800 million to $1.7 billion. This is the last man on Earth whom taxpayers should be subsidizing. It’s long past time for sports fans and everyone else to take a stand against publicly funded football stadiums, baseball parks, and basketball arenas. Maybe Daniel Snyder is the man who will push us all over the edge. Are we really going to let this guy hoard our tax dollars? Really?